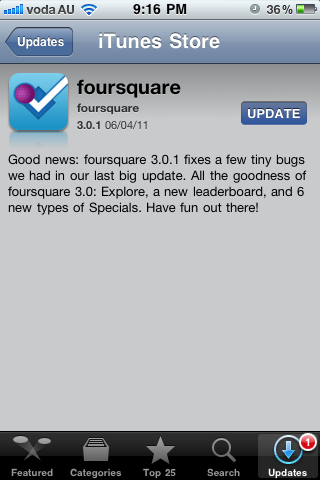 Geolocation mobile application, Foursquare has just released version 3.0.1 of their iPhone/ iOS application. The new version fixes a few small bugs that the last major update, V3 unveiled. Foursquare has also taken extra security measures for its users by using HTTPS by default across smartphone applications, mobile site and even regular websites. That’s right, even if you head over to Foursquare’s website you will be accessing via a secure connection. Facebook and Twitter recently made similar changes, allowing users to access these social networks on a HTTPS connection – however users need to opt in compared to Foursquare making this security level the default. This means if you are using Foursquare via a public Wifi (which now in Sydney [and Australia] we are starting to see a lot more free public Wifi networks), when you check in – your location data will be sent over an encrypted connection.